Minimalism has inspired me and taught me so much since I first discovered it three years ago. It has helped me not to just re-evaluate my possessions but also my attitudes to money, time and lifestyle. Now we live a happier, simpler life on a much smaller budget. Over the last three years I have decluttered years of possessions, gone part-time, downsized our house, reduced my overspending, streamlined my wardrobe, started to waste less food, begun to enjoy more time with family and friends and found more time for interests like reading and walking. I have also, of course, been inspired to start writing this blog. So what are my minimalist plans for 2014? I have big minimalist plans for 2014. Living in a much smaller house requires discipline but stuff soon creeps back in. Since moving here in June 2012 we have celebrated several birthdays and two Christmases and the house is beginning to groan a little with the excess weight of surplus possessions. Now is the time for further decluttering. Here's a list of my main minimalist aims for this year. Declutter our loft space (this has now become our 'spare room' a.k.a. our dumping ground). Although it is invaluable for storing items we use only occasionally it still contains items from our last house move that we have still not used. Time to go through everything in there. Declutter our bedroom (we have stuff stashed under the bed and few clear surfaces). Remember my Making Room series? Time for a relaunch - this room deserves so much more. Declutter our paperwork (my least favourite job). Have a serious attempt at decluttering my laptop as it is suffering from a severe lack of memory. Continue editing my wardrobe. I followed Project 333 twice last year (winter and summer) and my wardrobe is emptier but I still have a suitcase of clothes in the loft. It's time to revisit these items and either sell or donate them. It would be so much easier to have all my clothes in one space or at least to know that my out-of-season clothes in the loft are all needed. Create a wish list to move my wardrobe nearer to a fully coordinating capsule wardrobe. Project 333 has taught me that a capsule wardrobe does require planning. Apart from a £40 gift voucher (Christmas present) I think I could manage a whole year without buying clothes. I intend to write about any new wardrobe purchases here as means of disciplining myself. If I do buy more clothes they will be to fill the gaps in my wardrobe. Redesign our small lawned garden into a low maintenance courtyard garden. Last year we hoped to remove our small lawn but were unsure exactly how to do it. It would be great to accomplish this makeover in 2014 as it would free up more time and give us so much pleasure. Minimalise time wasted to allow more time for personal and health goals - but that's another post. Minimalise money wasted by following a strict grocery budget to allow for a few new experiences and treats (coffee shops, days out and possibly a holiday) throughout the year. This year I aim to analyse my spending diary, menu plans and shopping receipts much more regularly and thoroughly. So I'm setting myself quite a few challenges: major decluttering, a garden makeover and sticking to a tight budget. I need a lot of motivation so as well as reading my favourite minimalist blogs I will be gleaming tips from my frugal blogging friends as much as I can. 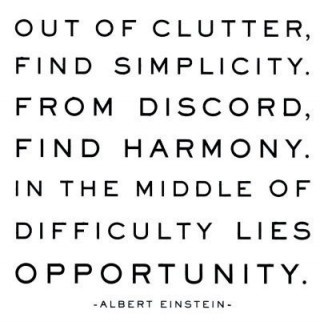 Do you have any major decluttering projects for 2014? Would you like to simplify your life more this year? I'd love to hear from you. Sounds like a great plan - love this post! Very thoughtful with specific goals to a lighter year. I'm with you on clearing surfaces. One of the reasons is that I absolutely hate dusting - we live in a small house too and I'm sure that being confined to a few rooms rather than several means they get dustier more quickly. Moving knick knacks around to clean is a pain. The other, more important thing, is that you only have on display what you really love, and fewer things mean you really appreciate them as they're not competing for attention with everything else. Rotation keeps things interesting and you won't have to part with things if you really can't bear to. I'm determined to declutter lots this year. Old toys, books, excess clothes - it would be lovely to pare down as much as possible. And I really must tackle the garage - we have a loft conversion, so the garage has become the dumping ground. Good luck with your aims, I'll be following along to see how you do! My get rid of 2014 items in 2014.I began the declutter project 3 weeks ago and am half way there already. I have a page on my blog listing everything I turf! I like the fact that you are including your "time wasted" in the de-cluttering efforts. I also think keeping things like banking and investments simple helps to uncomplicate things. We use one investment firm for our retirement accounts rather than having them spread out at different establishments. Also, we purposely have only one credit card. I am such a declutterer that I don't even allow texts or emails to sit in my phone after I have read them - I delete them immediately, unless of course there is pertinent info I need to keep. I have friends who almost never delete their messages! There is one major area I need to work on and that is photographs. We have years of family photos to sift through and I don't even know where to begin! Challenging plans but I will be looking forward reading your experiences. I will continue decluterring, I definitely think I can do better on this. From my clothes to the house. I have been working on this over the past years, but at a slow pace, and I would like to gear up a bit. Budgeting is also an aspect I would like to work on. And I have on the professional side also ambitions. Wishing you a wonderful year! I love all your plans! Minimalism and/or simplifying is an ongoing process and it seems there's always work to be done...but I really enjoy the process. This year my aim is to reduce the amount of stuff that enters our house - I'm keeping a list so I can assess what the main causes are.....I suspect it's me lol! I will continue to declutter. Thanks to you my wardrobe is looking much emptier , my new purchases like you will be better planned! I am trying to concentrate on becoming more organised this year too! Hi Claire and Happy New Year! I love being organized but hate de cluttering - I'm with you on the paperwork. We downsized 16 years ago and try not to gather too much that we don't need. Our attic has become a repository for our things and those of our children, but the attic is now overflowing and I plan to tackle it in 2014. I retired from teaching 6 months ago and I could never buy another item of clothing and still have way too much. I have put things in the attic that are not worn and in 1 year, if I didn't want it, then it will go to charity. I love the concept - Just A Little Less. You’d have to be careful on throwing away all of that clutter, though. Some important documents may be in that mountain of scrap. You’ll never know with papers since they all look the same. If possible, there are document storage options you could use to make sure that you don’t throw away any important papers. This is a good plan for sure! I am trying to start the big de-cluttering for some tome already..I definitely need some of your determination! :) Thanks for the post! Greets! Great post! I love how determined you are! Thanks!